HUBER+SUHNER has extended its connector portfolio with VITA 67, the RF addition to the VPX platform. VITA 67 is designed for customers who desire quick installable, excellent performing, durable and standardised multi-contact solutions. 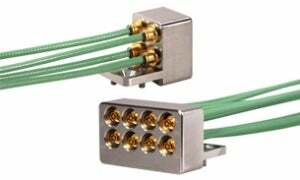 HUBER+SUHNER VITA 67 is the first true high performance 65 GHz SMPM cable assembly in the market. Thanks to the Minibend bend-to-the-end technology, tightest bending radii (0.06in / 1.5mm) are applicable right behind the connector. The snap-in captivation method guarantees an easy and quick installation without any tools and loose parts. VITA 67 is designed for side-by-side implementation with VITA 46 hardware and can be assembled with >Ø.086 coaxial cable types.